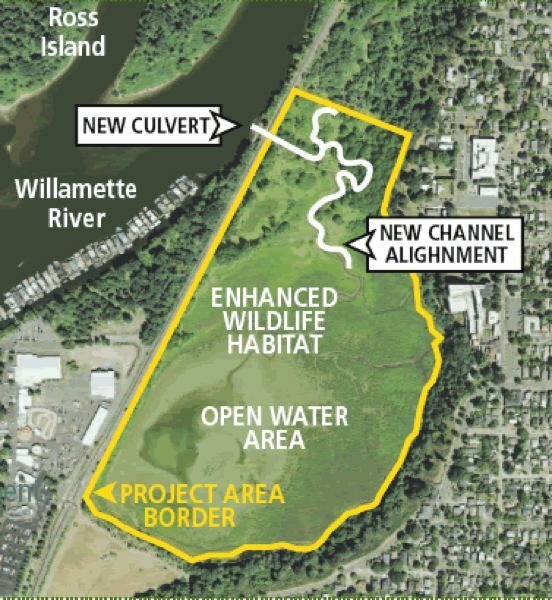 Four-month project begins to improve conditions for salmon, birds and other species at urban wildlife refuge north of Sellwood. 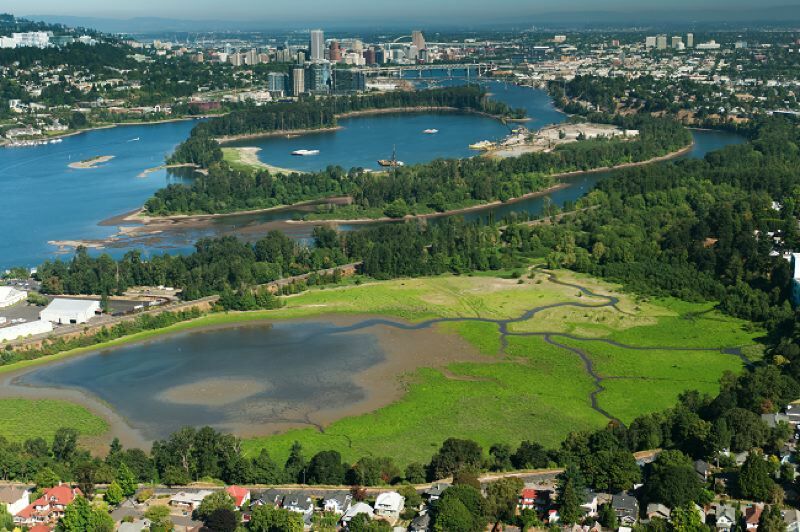 A major habitat restoration project commenced this week at Oaks Bottom Wildlife Refuge, a complex of meadows, woodlands and wetlands in the Willamette River flood plain north of Portland's Sellwood neighborhood. The project is being undertaken by the U.S. Army Corps of Engineers in collaboration with the Portland Bureau of Environmental Services and Portland Parks & Recreation. Crews will replace a small pipe culvert under the Springwater Corridor trail that currently blocks salmon passage into the wildlife refuge. Workers also will install a large concrete culvert to improve salmon access and water flow between the refuge and the river. Crews also will deepen channels to improve water flow for all resident wildlife, including bats, frogs, reptiles and the 175 species of birds that use the protected area. In the spring, project partners will plant thousands of native trees and shrubs. A new overlook and a viewing platform will also be built. The Springwater Corridor bicycle and pedestrian trail going through the refuge will be closed starting July 9 to accommodate construction, and will remain closed through October 31. Pedalers and hikers may continue to use the trail to access the wildlife refuge but through traffic will not be allowed. Footpaths in the refuge will remain open. Alternate routes include the Sellwood Bridge connection to the newly paved Willamette Greenway Trail on the west side of the river, and the Southeast 19th Avenue Neighborhood Greenway, which connects to the bike lane on Southeast 17th Avenue, on the east side. Access to Oaks Amusement Park will be maintained from the south.